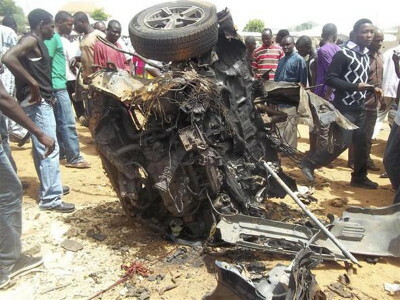 Four female teenage suicide bombers killed two people and injured 16 others in a residential area in the north-east Nigerian city of Maiduguri, a disaster agency spokesman said. The girls knocked on the door of a house and then detonated their devices, a representative of the state-run emergency service in Borno State said. The focus on individual homes is a new tactic. The blasts in the Muna Garage area, on the edge of the city worst hit by jihadist group Boko Haram's eight year insurgency, occurred around 1:15am, National Emergency Management Agency (NEMA) spokesman Abdulkadir Ibrahim said. "Four female teenage suicide bombers and two other men died," he said. The number of attacks or attempted attacks bearing the hallmarks of Boko Haram in crowded areas, such as markets and refugee camps, has escalated since the end of the rainy season in late 2016. Most of the attacks have been foiled or the suicide bombers have only managed to blow themselves up. The jihadist group has killed 15,000 people and displaced more than two million during its insurgency in its campaign to create an Islamic state governed by a harsh interpretation of sharia law in the north-east of Africa's most populous nation. On Tuesday, the group posted a video purporting to show the killing of three men accused of being military spies.